What Day Of The Week Is June 1? 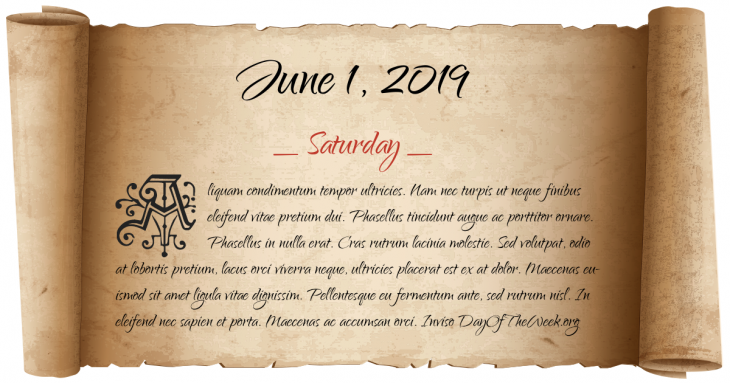 June 1, 2019 is the 152nd day of the year 2019 in the Gregorian calendar. There are 213 days remaining until the end of the year. The day of the week is Saturday. Hugh Capet is elected King of France. American Civil War, Peninsula Campaign: Battle of Seven Pines (or the Battle of Fair Oaks) ends inconclusively, with both sides claiming victory. World War II: Battle of Crete ends as Crete capitulates to Germany. British Overseas Airways Corporation Flight 777 is shot down over the Bay of Biscay by German Junkers Ju 88s, killing actor Leslie Howard and leading to speculation the downing was an attempt to kill British Prime Minister Winston Churchill. Who were born on June 1?